The House of MG in Ahmedabad. In an era in which just about everyone claims to be a “foodie”, the cliche has been rendered meaningless. Yet, paradoxically, few hotels focus their marketing on the delicacies they offer even when food is the main reason to visit them. I am greedy rather than a foodie, the result of being sent to a boarding school relatively young. Gourmet hotel kitchens with generous owners and staff thus score higher in promoting my sense of well-being than they might for other travellers. In the past five years, three hotels with exceptional food left me hankering to go back to feast at their tables. 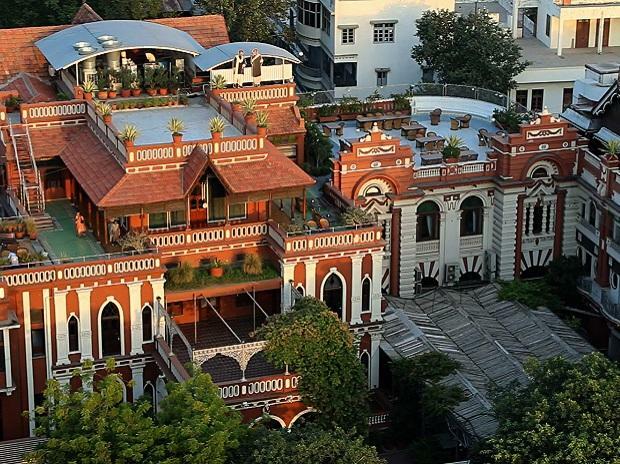 Ganga Kutir, an hour and a half out of Kolkata, The House of M G in the heart of Ahmedabad and The Bangala, deep in Chettinad, are very different hotels yet similar. They are as diverse in some ways as this country is: The House of MG is strictly vegetarian but in such an opulent way that no one could consider this a deprivation, whereas the chefs at The Bangala appear to have raided every butcher in the vicinity and flown in supplies from fishmongers on the coast. 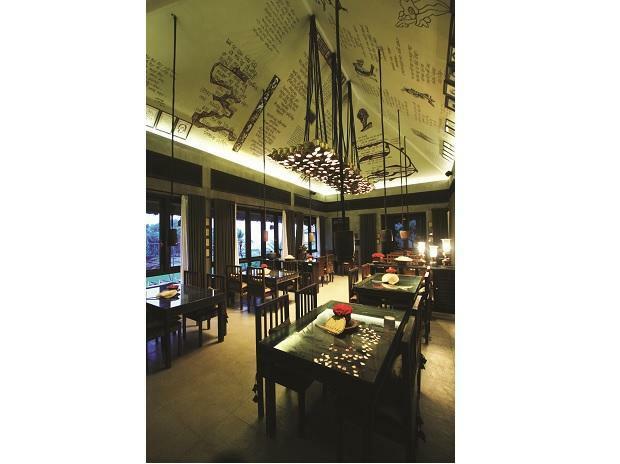 Ganga Kutir, befitting a hotel that is a homage to Bengal and Bengali food, is somewhere in between. Each has a single owner who seemingly regards a profit and loss statement as an afterthought. 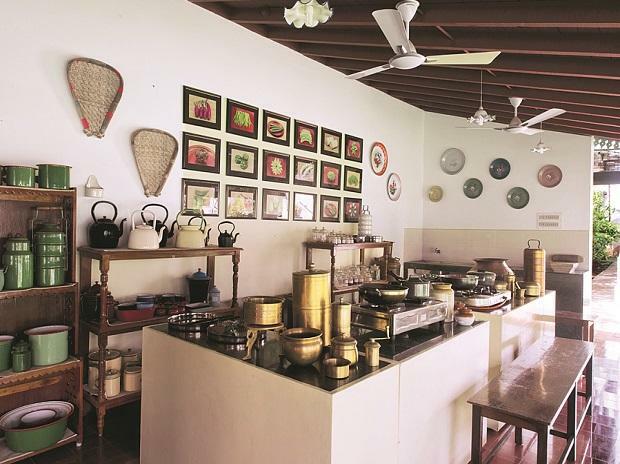 The kitchen at The Bangala, Chettinad. Views from the main dining room at Ganga Kutir (raichakonganges.com/resorts/ganga-kutir) include small ponds that dot the typical Bengali village. I scarcely noticed because I was there for a friend’s 50th birthday and we were all craning our necks to take in the ceiling. There are verses from Rabindranath Tagore written on it. They seemed an agnostic metaphor suggesting that heaven was an illusion and all that mattered was poetry and food. The dining room is something of a show-stopper, complete with a chandelier of brass pots. But it is the food that takes centre stage. At least half our party were Calcuttans still living in Kolkata. Even they ate in reverential semi-silence. The balance of flavours in the Zamindari Thali was masterful. The roasted mung dhal flavoured with mango and ginger was memorable, but almost every mouthful was, from the delicately fried vegetables at the beginning that make Japanese tempura such an anti-climax to shukto and malai chingri. The aangan-like terrace on the roof of The House of MG (houseofmg.com) has the skies as a backdrop, but convincingly creates the impression of a village feast. Again, the balance of flavours has been choreographed by a culinary genius; owner Abhay Mangaldas’ family recipes figure prominently. To begin at the beginning; sarbats and fresh salads are unlike any I have eaten anywhere else. 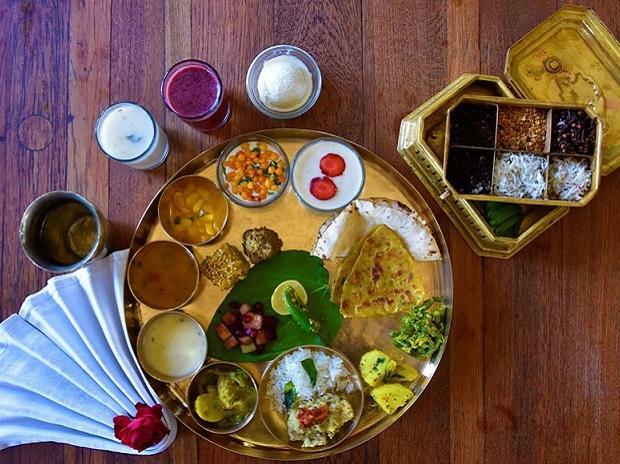 These could count as the offerings of a wellness retreat, but for the fact that you eat, among other things, the heavenly Gujarati rotlis made of corn and bajra in quantities that are excessive. No trip to Mumbai for me is complete without a Gujarati meal or two, but even so The House of MG was a revelation. The menu changes daily, which the hotel reveals a week ahead, making it impossible to eat anywhere else. My delightful but avowedly carnivorous ex-colleagues in Ahmedabad once outvoted me and made me take them to a Parsi restaurant one evening, but that is the only exception in two trips to Ahmedabad. I had planned to ask a cousin if I could have my 75th birthday, still a couple of decades away, at the Madras Club’s River Room. But, this was before I visited The Bangala (thebangala.com) on January 1 last year. The dedication to showcasing the best of Chettinad food is the very opposite of what a food and beverage manager would do, which is to say it is uneconomic. On my last night, I noticed the French family at the next table was having a completely different dinner from ours. When I asked the owner, Meeenakshi Meyyappan, why, she said she tailored the menus to how many nights the guests were staying at the tiny property so that they could experience the breadth of Chettinad cuisine. I managed three dinners and two lunches and overate at every meal. The crab curry is exceptional as is the mutton apukari. Surpassing the world-beating standards of Sri Lanka with a range of accompanying sambols and curries, the appams outdo any I have had at a hotel. My only regret is that someone at the front desk insisted my airport drop come too early and I missed my last breakfast there. Yes, even the breakfasts are that good. After three days of reckless greed, it seemed a kind of divine punishment.